Former Mayor Gavin Newsom and Mayor Ed Lee issued a challenge to the City: to have 100% of San Francisco's electricity demand be met with renewable energy. The Department of Environment and the Mayor's Office convened a task force to develop a practicable plan and advise the City on how to best achieve the goal. SF SunShares is an employee solar discount program offered by SF Environment and the Business Council on Climate Change. Hydropower is the use of water to power machinery or make electricity. Anyone who has listened to the rushing streams of the Sierra Nevada mountains or stood in the surf of the Pacific Ocean knows the power of moving water. Geothermal energy is the heat from the Earth. This heat can come from molten rock (“magma”) deep inside the earth, or very hot rock and ground water a few miles below the Earth’s surface, and can be used for direct heating or to produce electricity through a steam turbine. Biomass and Biofuels are all domestically produced renewable energy sources that can be used as a sustainable feedstock for the production of transportation fuels, heat and power. 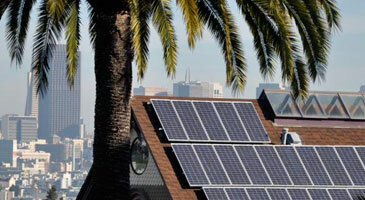 The San Francisco Public Utilities Commission is responsible for the installation, maintenance and operation of the City's nine municipal solar installations. In total, these energy facilities can generate up to 7.2 megawatts of energy. GreenFinanceSF allows commercial property owners to finance renewable energy projects, as well as energy and water efficiency, through a municipal bond and repay the debt via their property tax account.